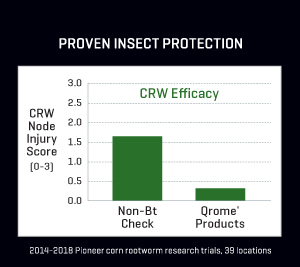 Pioneer® brand Qrome® corn products are the most optimized balance of insect protection and agronomic performance in the Pioneer product line-up and come fully equipped with a new, triple stack of defensive traits and dual modes of action to defend against above- and below-ground pests. This new technology is the key to unlocking higher yield potential on your acres. Learn more. 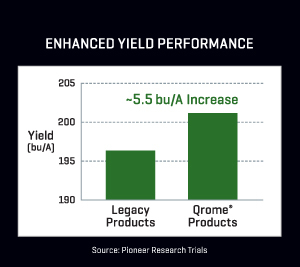 Through more-efficient breeding, Qrome products deliver enhanced yield performance in a full pipeline of high-performance maturities across the Pioneer product lineup. Qrome products have been tested extensively in multiyear, local research trials across the U.S. 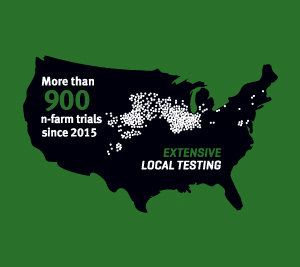 Since 2015, Qrome products have been tested in 900+ Product Knowledge Plots (PKP) and IMPACT™ trials under a variety of conditions and environments. Qrome products offer improved integration across a broad range of Pioneer germplasm, including the most advanced technology for above- and below-ground insect protection. 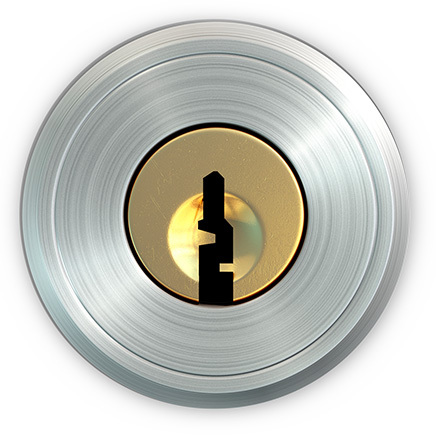 Get the latest updates on Qrome products. Talk to your Pioneer sales professional about availability in your area. *2011-2015 DuPont Pioneer research trials. 2018 Qrome performance data is based on the average of 244 comparisons made in the United States through Nov. 14, 2018, Comparisons are against all competitors and within a +/- 3 CRM of the competitive brand. Product responses are variable and subject to any number of environmental, disease and pest pressures. Individual results may vary. Multi-year and multi-location data are a better predictor of future performance. DO NOT USE THIS OR ANY OTHER DATA FROM A LIMITED NUMBER OF TRIALS AS A SIGNIFICANT FACTOR IN PRODUCT SELECTION. Refer to www.pioneer.com/products or contact a Pioneer sales representative or authorized dealer for the latest and complete listing of traits and scores for each Pioneer® brand product. Herculex® XTRA insect protection technology by Dow AgroSciences and Pioneer Hi-Bred. Herculex® and the HX logo are registered trademarks of Dow AgroSciences LLC. YieldGard®, the YieldGard Corn Borer design and Roundup Ready® are registered trademarks used under license from Monsanto Company. Liberty®, LibertyLink® and the Water Droplet Design are trademarks of Bayer. Agrisure® is a registered trademark of, and used under license from, a Syngenta Group Company. Agrisure® technology incorporated into these seeds is commercialized under a license from Syngenta Crop Protection AG.